Atmels AVR ATtiny10 are surprisingly powerful devices that come in an extremely tiny SOT23 package with only 6 pins. The have 1kb of flash, 32 bytes of SRAM and use the reduced AVR core which only supports 16 instead of 32 register. It seems like Atmels idea of these devices is to use them as an advanced blinker, and to replace tiny logic circuits. But other people have shown that much more is possible. For example the noiseplug (video), a chiptune player, and a Simon Says game. 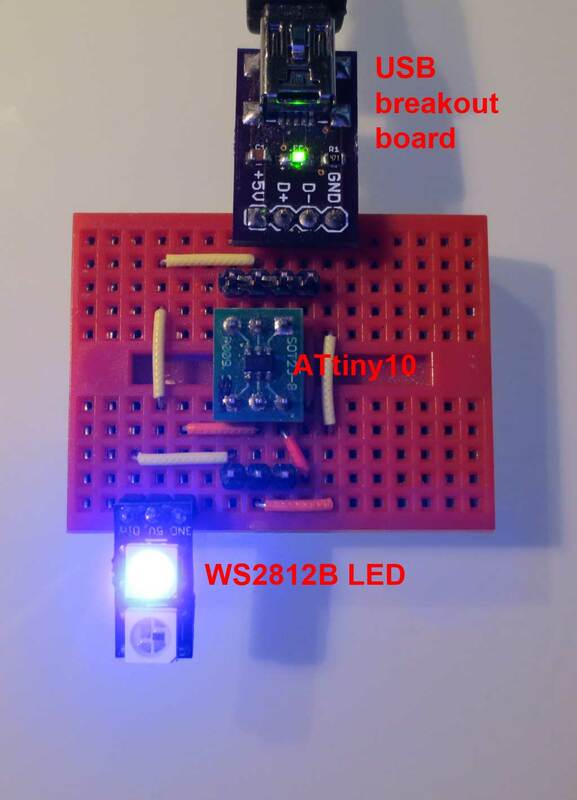 I previously used the ATtiny10 in the TinyTouchbutton, a touchbutton controlled light with WS2812 LEDs. This time I aimed higher: Is it possible to turn the ATtiny10 into a USB compatible device? My goal was to implement a subset of the little-wire functionality to control a WS2812 LED by USB. This takes 3 I/O lines, which is exactly the number of free pins on the ATtiny10. Littlewire supports several functions to control WS2812 LEDs on arbitrary I/O ports. I simplified this to only supporting a single LED on a specific pin, however still retained protocol compatibility. This means that all the little-wire host-programs still work. The finished device can, for example, be used as an RGB indicator LED similar to the Blink(1). My test setup is shown below. The ATtiny10 is almost the smallest part of the circuit. There are some discrete components on the rear-side of all PCBs, so do not be surprised about missing decoupling capacitors, zener diodes and resistors. Starting with V2.0, Micronucleus is going to use an interrupt free modification of the software USB implementation V-USB. This provides significant benefits for the bootloader, as it is not necessary anymore to patch the interrupt vector of the user program. A surprising side effect was a speed up of the V-USB data transmission, which may also be helpful in other applications. Here, I try to give a rough overview about the meandering work that led to this achievement. WS2812 LEDs are amazing devices – they combine a programmable constant current controller chip with a RGB LED in a single package. Each LED has one data input and one data output pin. By connecting the data output pin to the data input pin of the next device, it is possible to daisy chain the LEDs to theoretically arbitrary length. Unfortunately, the single-line serial protocol is not supported by standard microcontroller periphery. It has to be emulated by re-purposing suitable hardware or by software timed I/O toggling, also known as bit-banging. Bit-banging is the preferred approach on 8 bit microcontrollers. However, this is especially challenging with low clock rates due to the relatively high data rate of the protocol. In addition, there are many different revisions of data sheets with conflicting information about the protocol timing. My contribution to this was the light_ws2812 library V1.0 for AVR and Cortex-M0, which was published a while ago. A V2.0 rewrite of the lib was in order due to various reasons. And, to do it right, I decided to reverse engineer and understand the WS2812 LED protocol to make sure the lib works on all devices.